Each year I continue to be reminded of God’s grace as I see her oddly perched atop our tree. This year her placement on the tree was a bit precarious. Traditionally our daughter, with the help of her dad, had the task of placing her on top the tree. This has become a much more complex endeavor as our trees have gotten taller and so has she, but not matter what, they always pulled it off. This year we celebrate Christmas with new family members. Our son now has a wonderful wife and two precious kids. Our daughter is now married as well. So dad decided THIS year her husband would have the task of getting her, and the tiny/fragile angel, to the top of the tree. Let’s just say hilarity ensued as she sat on his shoulders and they wobbled toward the tree. After a few failed attempts, and a little more repair work, she finally sits in her place of honor. She is more worn this year, she lists even more and it does look as if at any moment she will topple over….it has been quite a year for her. It’s been quite a year for all of us…but there she is still. She continues to remind me of the gift of grace, the gift of not being perfect, yet being loved. May you find it easy to grant grace to others as you bask in the grace of our God. I hope you have enjoyed the advent posts this year as much as I have enjoyed writing them. Merry Christmas and Happy New Year and new beginnings! I’m not sure where she came from. I’m not even certain of her age. I do know that she sat atop the Christmas tree for many of my growing up years, quietly presiding over each holiday season. I acquired her from my mother many years ago. Her gold foil, cardboard wings, once ended in perfect points extending her stature to seven inches. Now her wing span is slightly reduced, as the tips went from being slightly bent, to folded, until they eventually tore off. Her dark red velvet dress, trimmed with gold brick brack, fits snuggly to her waist before flowing over her cardboard form. Her once silky, radiant white hair, now hangs in brittle coils around her shoulders. A little gold foil halo covers a place on her head where some of her hair has given way to the passage of time. Her head and hands are made of wax, as is the candle she holds in one hand. I remember her as a beautiful lady, her face perfect and delicate. Those qualities are now faded. Her head, once held high and straight, has melted somewhat. It now bows lovingly downward and a bit to the right. Two years ago a significant amount of time and effort was put into re-attaching her long held candle to her now miss shaped hand. Yep, she’s a bit of mess you might say. I like that about her. She doesn’t light up or sparkle, and quite often she is too small for the tree, making her look even more out of place. But I look forward to her presence in my living room each Christmas. Late at night, when the tree is lit and others have gone on to bed, I find myself thinking of her and all we have in common. weight every mother bears for her family. I know the need to bow my head in constant prayer. I love her imperfection. She’s a holiday reminder that God loves us in our imperfection. A love full of grace, a savior born to take on the sin of the world, a reason to celebrate, reflected in the melted features and unraveled edges of our Christmas tree Angel. This is the fourth week of Advent. Each week four prior to Christmas, we pause in remembrance of the birth of our Savior. In some households a candle is lit in recognition of each of the Advent themes. This week, we light the candle of LOVE. I am addicted to holiday smells. I stop in my tracks when I smell peppermint mocha steam rising from a hot mug, evergreen and balsam wafting from trees and wreaths or glorious cinnamon floating forth from everything from scented décor arrangements to baked goods. No matter where I am, a friend’s home, bakery or store, I will stop, close my eyes and take a long breath. Knowing my weakness, I try to avoid entering a store with a candle display this time of year…I have been known to over sniff. God loved us so much He sent His Son so that we would have a way to Him. Christ’s love was on full display as He gave up His life so we may know forgivness for our sin. This sacrificial love was a fragrant aroma to our God. As we celebrate the birth of our Savior, Jesus Christ…”For God so LOVED the world, that He gave his only Son”, let us also be mindful of the example of LOVE He showed us. Let us strive to be a FRAGRANT AROMA. This is the third week of Advent. Each week four prior to Christmas, we pause in remembrance of the birth of our Savior. In some households a candle is lit in recognition of each of the Advent themes. This week, we light the candle of PEACE. At the birth of John the Baptist, in Luke 1:76-80, it was told of the message he would share with the world. As I read this, I could not help but hear the song “You are My Sunshine” playing in my head. Never really thought of it as a Christmas carol, but maybe it should be? The birth of Jesus WAS God sending His SONshine to light our way to peace. Peace with man, peace with God. We celebrate the birth of Jesus Christ because His peace is all about finding light in the darkness, the reconciling our sin filled heart with our Holy God. This time of year, I find myself mindful that God’s peace does not mean the world is without troubles. It does not promise us a lack of darkness. God’s peace is the light to navigate the darkness and redemption from the eternal consequences of a dark/sin filled life. Next time you get a chance to sing some Christmas songs, be sure to include a boisterous rendition of “You are My Sunshine”! This is the second week of Advent. Each week, four prior to Christmas, we pause in remembrance of the birth of our Savior. In some households a candle will be lit for each of the advent themes. This week we consider JOY. I know “joy” is something in our souls that fills us even when our circumstances are challenging. I have felt joy overflowing when life was favorable, but I have also known joy when things just were not going as I had planned or desired. I think of Joy as being able to expect good things even in bad times. Joy is that thing that buoys you up when something drags you down. When things are hard, I take joy in knowing God will bring me through. When I don’t understand why someone is hurting, I take joy in the knowledge that God is able to comfort when I can’t and He will be glorified. When deep loss darkens my life, I rest in a quiet joy that God is still in control and He can and will ease the hurt. I have also known what its like to misplace my joy. I have felt heartache so deep I could not imagine joy. I have battled anger with God, frustrated with His ways not aligning with my way. I have allowed myself to dwell on the hard stuff and stubbornly ignore the things God was trying to show me. If I am being honest, and I will be, I know exactly how I misplace my joy. Sometimes I tuck God away and fail to spend time seeking Him. It is all too easy to get distracted and miss out on all the evidence of Him in His creation. When I stop reading His Word, my soul looses its thirst for Him. I depend on God for my joy. It is not something I can make myself be, it is something God places in me. We are currently visiting the historic city of St. Augustine Fl. While reading about the man for whom the city is named, I found a very interesting quotes from St. Augustine, a Christian Bishop and theologian. He said, “Indeed, man wishes to be happy even when he so lives as to make happiness impossible”. I laughed out loud. I had spent the day praying and thinking about this blog post, and there in a random snippet of local lore, I found myself humbled and challenged. Am I making it possible to know joy? I want to always have the joy of the Lord in my heart, the same joy the angels proclaimed when they announced the birth of Jesus. Jesus is good news of great joy because even in our sin, God was providing a way for us to be free and forgiven. This is the joy that fills us even when life is hard. Yep, time to untuck my God, chase after His Word and learn how to DANCE with His Joy in my heart. This is the first week of Advent. Each week, four leading up to Christmas, we pause in remembrance of the birth of our Savior. In some households a candle will be lit in recognition of each of Advent themes. This week we light the candle of HOPE. I remember playing with the little plastic figurines of our family’s nativity as I set them in position. I especially liked the sheep and the baby. At first I did not understand what the scene was to represent, and just liked to play with them…but as I grew older, I took joy and pride in being very careful with setting it up. When I got married and had children of my own, it made me so happy to pass on the setting up of the nativity to my daughter Ashley. Over the years I watched as she too played with the small images. My heart was full when I saw her idea of what that night may have looked like grow as she did. One year, after learning in Sunday School that the wise men actually arrived much later after the birth, we found the figurines depicting the wise men set across the living room. She said they were still “a far”. This year the setting up of our nativity set was even more eventful. Words cannot describe the sweet joy of watching my precious granddaughter sit with her Aunt Ashley as she showed her the set. As she discovered each little piece I could not look away. She was very intent. Her little 2-year-old mind was fast at work. She decided she was not a fan of the camel, therefore he was not allowed to be in the stable, or near it. And apparently the hay loft is a good place for cow to hang out. But my favorite part of it all was her placement of baby Jesus. He spent the better part of the day precariously perched on top of the stable. Eventually we would find him on top of her sippy cup and even in the hay loft. I will remember the image of baby Jesus on the roof of the stable for years to come! When I look at each tiny figurine, I consider the huge moment they represent. This was the moment God sent his Son, my hope for forgiveness, my redeemer and grace in the flesh. If not for the birth, life, death and resurrection of Jesus Christ, I would be lost, seeking, unfulfilled and hurting. In Him, I know forgiveness, joy even when things are difficult, and love I do not deserve. Tonight, as I sit to create this post, I can’t help but think about Jesus on the roof. Where would Jesus be found in my life today. Have I placed Him in the center of my life, easy for me to find? Have I tucked him away in a quiet out-of-the-way place, like the hay loft? Is it possible that I have placed Him in a remote part of my life, on a roof? Tonight I am challenged to rearrange some things. This week as we consider the Hope that we have because of the birth of our Savior, may each nativity set we see in the season remind us to find Jesus inside our hearts and not up on the roof. A Christmas Tree Angel….reposting this story has become a tradition. 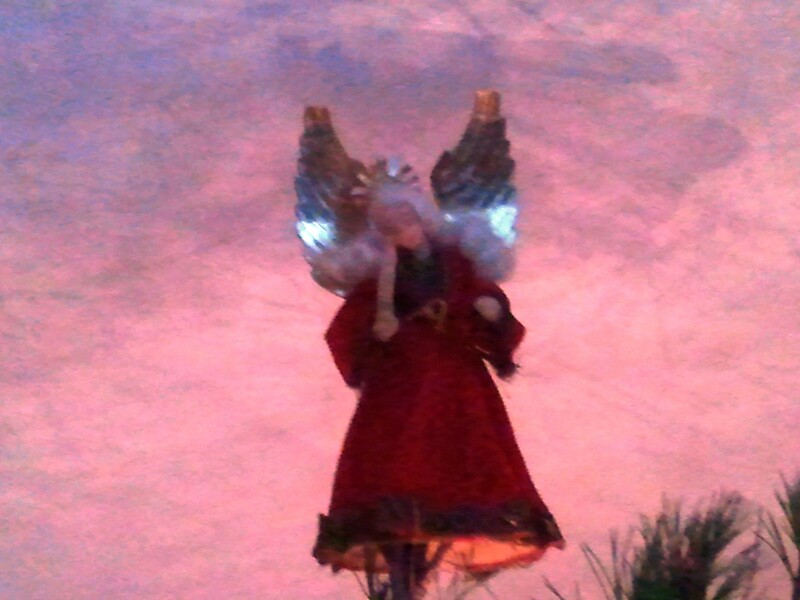 Each year I continue to be reminded of God’s grace as I see her oddly perched atop our tree. This year my angel is still carefully tucked away in storage, we are on our boat for Christmas, but her image is never far from my thoughts this time of year. I hope you have enjoyed the advent posts this year as much as I have enjoyed writing them. Merry Christmas and Happy New Year and new beginnings! I too, know what it’s like to have my wings bent and torn. I know what it feels like when your body gives itself over to the challenges of time. My hair is no longer silky or radiant, and I only wish had a halo to hide the places where it has become thin. I understand the sagging of her shoulders and the bowing of her head. I have felt the weight every mother bears for her family. I know the need to bow my head in constant prayer. I love her imperfection. She’s a holiday reminder that God loves us in our imperfection. This is the fourth week of Advent. Each week, four leading up to Christmas, we pause in remembrance of the birth of our Savior. In some households a candle will be lit in recognition of each of the Advent themes. This week we light the candle of Love. “How can it already be the fourth week of advent?”, I asked myself as I stared at my blank computer screen. Normally, I totally enjoy writing each advent post. I treasure the time reading my Bible, praying for guidance, contemplating my God, thinking of my family and friends who may read it, and pushing away all other distractions to focus on each theme. But this week found myself struggling. Which is absolutely CRAZY, since the advent theme of LOVE is usually one of the easiest to find in life everyday. I know of God’s love. I have seen His handiwork in my life time and time again. I have known His forgiveness when I could not forgive myself. I have seen His love and provision for me when I did nothing to deserve it. I have witnessed His unconditional love through those He placed in my life. I may not know a lot of things, but I know God loves me! SO why is this post so hard? I spent the last two weekends surrounded by love’s evidence. We traveled to Florida to celebrate my mom’s 80th birthday. My mom has always been a reflection of God’s love to everyone she knows. She was surrounded by family and friends who love her dearly. Meals were made, decor was set in place, laughter and conversations all gave evidence of love. Scott and I joined our son and his wife as they celebrated the revelation of the gender of our next grand baby. Our daughter and her fiancé were able to be in town also. We had a “family Christmas” time together in the short visit of one night. It was such a blessing and my heart was overwhelmed with love. Why then, was I sitting before a blank screen, my hands paused over the keys, my heart running through all of life’s most recent lessons. Nothing. The scene was set for inspiration: Soft Christmas music, check. Bible open to Luke chapter 2, check. Coffee cup in hand, check. Pen and notebook at the ready, check. Prayer for words/wisdom/inspiration, check. Sigh, still NOTHING. Of all the advent themes, LOVE, feels like it is perhaps the most important. The birth of Jesus Christ was great love. HIs arrival was the fulfillment of God’s love for us. His birth, His life, His ministry on earth, His death on the cross, and His resurrection were all because of God’s love for His creation. Because of all this, you and I can ask for forgiveness, be forgiven, know grace and be reconciled with God. The “amen” in my head had no sooner closed my prayer, than a big fluffy head pushed itself onto my lap. Charlie, our floppy, furry Portuguese Water dog, is usually content to curl up beside me when I am at my computer. Today it seems he is was in need of a bit closer look at what I was doing. He pushed himself onto my lap, with no regard for the laptop that resided there at the time. I carefully closed it down and slid it from beneath him. I then gave him what he wanted, my attention. AND there it was…Attention. I rubbed his wobbly noggin and silently thanked my God. The gift of God’s Son, our savior Christ Jesus, was a gift of absolute and underserved LOVE. This love demands attention, not just this advent week, but everyday, all year round. It is so easy to let something so powerful, impactful and precious become trite or taken for granted. Time for me to wrap this post up, my “reminder of God’s love” needs to go for a walk.